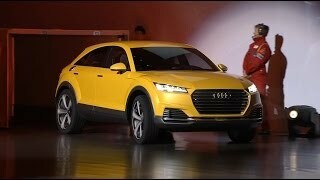 Audi has introduced Audi TT Off Road Concept 2014 to the market with superb and outstanding features. It provides the customers with beautiful driving pleasure. The TT concept will play a big role in deciding the future of the TT lineup. 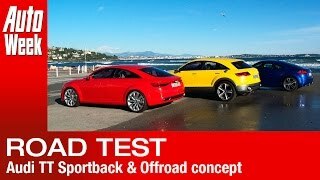 Let us have a close look at the reviews of the sporty model Audi TT Off Road Concept 2014 and get to know more about the stuffs and the features it contains. The interior of Audi TT Off Road Concept 2014 has a classy interior. It is cramped and offers space to four people. There are Slim sport seats with integrated head restraints. The two interesting features of the model are the multifunction steering wheel and the MMI terminal on the center tunnel console, both of which serve more than just their functional purposes. It also gives the driver the easier connectivity. Talking about the technology, there is a 12.3‑inch TFT display which produces high-quality 3D graphics to go with plenty of neat options, either in classic mode or Infotainment mode. In addition it comes with the three Audi Smart Displays, tablets that make for good entertainment for passengers. 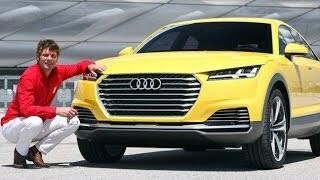 The Audi TT Off Road Concept 2014 comes with a sporty look. The front has broad Singleframe grille bearing the four rings is sculpturally embedded in the body. There are large air inlets below the Matrix LED headlights which are framed in sharp edges and structured with louvers. These sleek LED headlights provide the aggressive sporty look to the model. There is horizontal line up the front of the new TT model. The side window design follows the sporty coupe line. Around the back, there are horizontal line frame on the taut surfaces. A blade with a quattro logo connects them and provides for visual width. 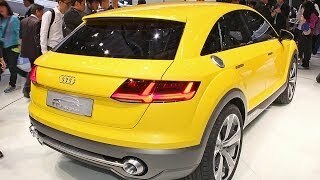 The Audi TT Off Road Concept 2014 comes powered with 2.0-liter, four-cylinder, gas engine that nets 292 horsepower, adding up the total of 650 nm of torque. 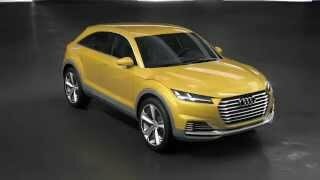 It allows the model to knock 0-62mph in just 5.2 seconds while the top speed of speed of Audi TT Off Road Concept 2014 touches 155 mph. It has two electric motors, one at the front axle that produces 53 horsepower and another one at the rear axle that develops 114 horsepower. The whole system powers the output of 408 horsepower.